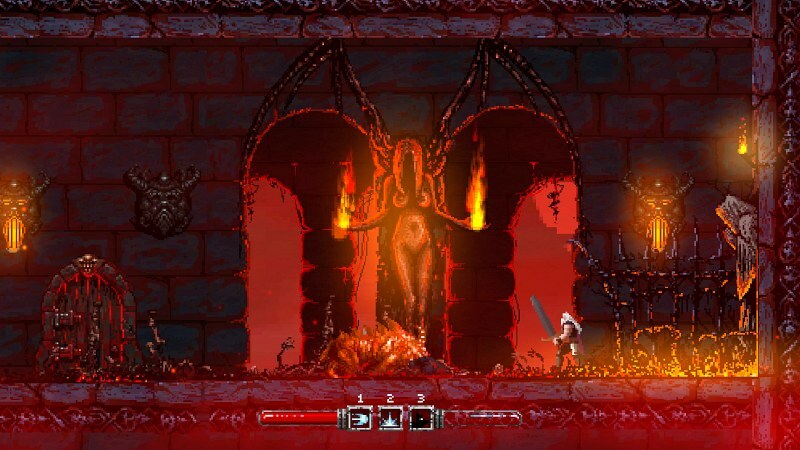 Prepare yourselves for blood dripping from the walls and gory bits everywhere, as Wolf Brew Games have announced that their very bloody pixelated action hack and slash platformer of ' Slain! ', is now available to buy on GOG! A big Kickstarter and Steam Greenlight success and one of our most eagerly awaited releases, has stunning jaw dropping visuals and lots of bloody effects that would make even the horror fans amongst us look upon in delight. In this draw dropping release you play as Bathoryn and must battle your way through a doomed land packed with gruesome pixel art foes before ascending (or sometimes descending) each tower, defeating puzzles, traps and monsters alike. At the heart of each keep, he must confront a mighty overlord. Defeat it and Bathoryn’s quest continues. Fail, and you’ll die gruesomely - mauled by werewolves, disintegrated by floating monstrosities, squashed by great weights or torn apart by hidden blades!